In her second month as a police officer, 40-year-old Marinda Singer drove a Navajo Police Department SUV out to Asaayi Lake, an hour north of Window Rock, Arizona, in search of a black Chevy pickup stuck in mud. Elroy Naswood, her field training officer and former elementary school classmate, rode in the passenger’s seat. Two open Coke cans sat between them, sizzling in their cup holders. The road Singer followed, flush with the New Mexico-Arizona border, cut through great patches of yellow wildflowers. Officer Marinda Singer first thought about joining the police force when, in high school, she sat in the cruiser of a friend's father. Dispatch in Window Rock said the pickup driver sounded intoxicated. The situation seemed tame, but Singer still felt on edge. “The call could be totally something other than what we’re given,” she said, looking out at the one-lane road from under the brim of a black department cap. Singer generally keeps her expectations loose. On her first day, she pursued a reckless driver, followed the car into a ditch, and drew her weapon, her mind racing through the training she finished only a week before. In late June, Singer was one of 12 officers, including five other women, in Class 52, the first graduating class of the newly reopened Navajo Police Training Academy. Out of the more than 200 tribal police forces in the United States, the Navajo Nation’s is the largest, and it’s the only one that trains its own officers. For nearly a decade, though, there was no academy. After the last police chief stepped down in 2008, the old facility dwindled and closed. The department began sending occasional recruits to train in Phoenix or Tucson, but many dropped out, and those who did graduate came back without training in Navajo law. But after the department hired a new police chief in 2016, it pooled funds to open the new academy: two doublewide trailers, surrounded by chain-link fence in the shadow of a correctional facility, in Chinle, Arizona. The new cadets shore up the 199 officers who currently patrol the reservation, where each officer monitors more than 100 square miles. 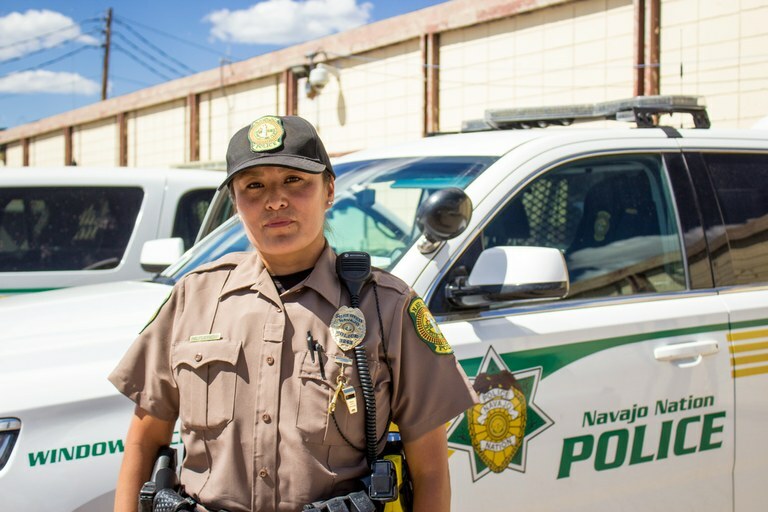 Class 52 will help the Navajo Police Department cover its vast territory. Already, the academy staff is training its next class and recruiting another. If Singer, her fellow cadets and future officers stick with it, the department will be able to serve — and protect — the Navajo Nation on its own terms. But that’s only if officers can find who calls them. After Singer drove an hour and a half to Asaayi Lake and patrolled its edges, there was no sign of the stranded truck. Naswood clicked his tongue, and Singer was disappointed. “We should have brought our fishing poles,” she said. 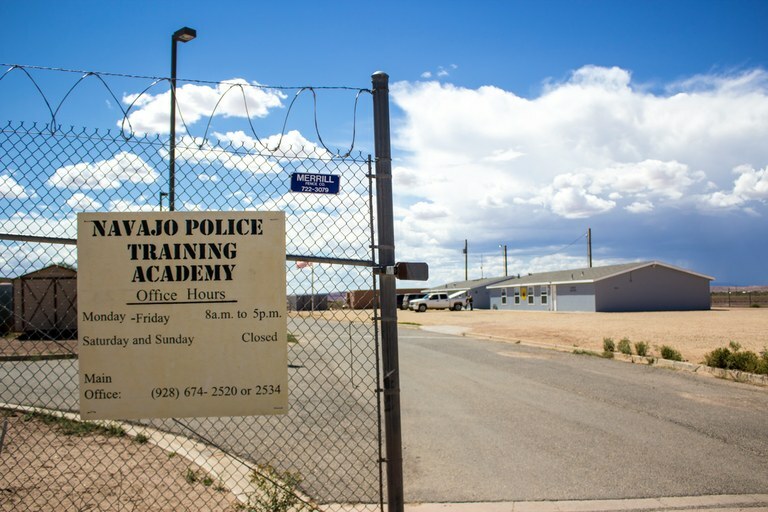 Until a permanent academy is built, the Navajo Police Training Academy operates out of two doublewide trailers. In Chief Phillip Francisco’s office in Window Rock, maps of the Navajo Nation hang on the walls. The police department’s seven districts jigsaw across a territory larger than West Virginia. Officers have to master some of the most complicated jurisdiction details of any force in the nation: Along with Navajo law, they must know Arizona, New Mexico, Utah and federal laws. On another wall, there’s a to-do list — 36 items in red Sharpie on a giant easel pad. No matter where he sits, Francisco is reminded of unpatrolled areas and unfinished tasks. Francisco knew about the Navajo Police Department’s problems while he worked at different departments in San Juan County, New Mexico, which overlaps with the reservation. In 2005, the Navajo Police Department had over 350 employees, bringing it close to national averages for police-population ratios — about one police officer for every 418 people, according to FBI data. But after the previous chief stepped down, the department lost structure. The department couldn’t afford a competitive salary for a replacement, and candidates stopped applying. The old academy in Toyei, Arizona, eventually shuttered. Captains rotated through the role of acting police chief, and a number of officers left for other agencies near the reservation. Reopening the academy took a backseat to simply keeping the department running. “For a long time, I think, we were the black eye,” Francisco said. He started work in August 2016, and re-opening the academy was one of the first items on the to-do list, followed by purchasing body cameras and new weapons. He is slowly crossing items off. In 1868, after a brutal 300-mile deportation at the hands of the U.S. Government, the Navajo returned to what is now the Four Corners area. When surrounding white settlers began complaining about stolen livestock, Navajo and federal representatives agreed to begin an experiment: Manuelito, a Navajo leader, assumed the role of police chief and amassed a tribal police force. Franklin Sage, the director of the Diné Policy Institute at Diné College, sees this early police activity as a tool for enforcing the reservation system. It was less about livestock, he said, and more “a way of protecting settlers, and to try to control and keep the Navajo within a certain area.” Though tribal members made up the force, they represented a foreign system of power. Even today, if Navajo officers apprehend a non-Native offender, they often can’t do much without other departments’ assistance. As federally managed law enforcement developed in most reservations by the end of the 19th century, it opened a fissure for control. Under Bureau of Indian Affairs (BIA) direction, tribal police were expected to cut their hair, wear settler clothing and assist in removing children to send to American Indian boarding schools. These tactics transformed tribal police into “an agent of civilization,” Eileen Luna-Firebaugh, a tribal law enforcement scholar, wrote. 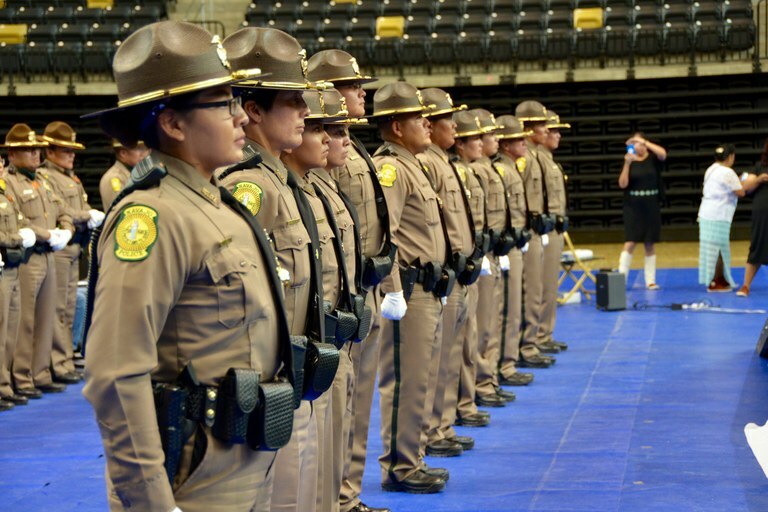 “That regimentation became a symbol of law enforcement, and it came over to Indian Country in the same ways the (boarding) schools did,” she said. In the 1980s, the Navajo Nation entered into a contract with the BIA to manage reservation law enforcement itself. While Navajo law enforcement began as an instrument of colonial control, Francisco views it today as a crucial part of self-determination. “It gives us the ability to police our people and to know the needs of our own community rather than the federal government just doing what they feel is right,” Francisco said. “They wouldn’t have the same input and love for our community that we have.” Part of sovereignty, he added, is the tribe teaching and enforcing its own laws. But the department is still financially tethered to the U.S. government. According to the National Congress of American Indians, funding for tribal law enforcement meets only 42 percent of the need nationally. And with his budget partially dependent on the federal government and federal grants, Francisco can only hire 41 more officers, bringing the force up to 240. At least 100 more are needed, he said, but with each officer costing around $76,000 in salary and equipment, that’s more than $7 million that he doesn’t have. The 52nd Navajo Police Training Academy class celebrates their graduation in Chinle this June. After their Friday afternoon lesson on crime prevention, the cadets sat in the classroom, wearing black ties and white collared shirts, Navajo Police Department pens clipped into the pockets. “I thought it would be a little easier than this,” said Joshua Martinez, a 24-year-old recruit. The day before, cadets’ bedrooms were “trashed” by staff after a shoe was left turned the wrong way. Earlier, the recruits underwent relentless physical tests — “getting smoked,” as the sergeants called it. The new class is nearly twice the size of Singer’s. Most are young, and some have military experience. Shawna Watchman, the oldest at 42, lived near the old academy as a girl. She remembers hearing the cadets march at night. It will take time to strengthen the philosophy. But, in the process, the academy is the root.